Crowley Maritime Corporation recently received a Humanitarian Award from Seamen’s Church Institute (SCI) for its relief efforts in Puerto Rico following Hurricane Maria. 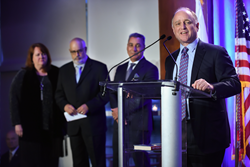 Tom Crowley, Chairman and CEO accepts the award on behalf of the company's 350 Puerto Rico employees. We are as humbled by this recognition as we are grateful for the extraordinary work of our teams in San Juan, Jacksonville and in other parts of the country following Maria. Crowley Maritime Corporation recently received a Humanitarian Award from Seamen’s Church Institute (SCI) for its relief efforts in Puerto Rico following Hurricane Maria. The award, which was accepted on the behalf of the company’s Puerto Rico employees by Tom Crowley, chairman and CEO, and Jose Nazario, director of finance in San Juan, was presented during the 41st annual Silver Bell Awards Dinner, which is attended by over 700 members from the shipping industry and associated companies. In the aftermath of the September storm, Crowley’s liner services and logistics teams, working with government and commercial customers, played an integral role in the recovery. The company’s more than 300 union and administrative employees resumed services and reopened company facilities, including a warehouse and the Isla Grande terminal, just two days after the storm passed, and began discharging government and commercial cargo from vessels to support relief efforts on the island within hours of the U.S. Coast Guard reopening the harbor in San Juan. Crowley has provided a constant transportation and logistics pipeline to the island since the storm made landfall – unloading more than 200 vessels in a 182-day period. Trailer Bridge, and Tote Maritime were also recognized with the award for their efforts during the recovery. Founded in 1834 and affiliated with the Episcopal Church, though nondenominational in terms of its trustees, staff and service to mariners, the Seamen’s Church Institute of New York & New Jersey (SCI) is the largest, most comprehensive mariners’ service agency in North America. Annually, its chaplains visit thousands of vessels in the Port of New York and New Jersey and along 2,200 miles of America’s inland waterways extending into the Gulf of Mexico. SCI’s maritime education facilities provide navigational training to nearly 1,600 mariners each year through simulator-based facilities located in Houston, TX and Paducah, KY. The Institute and its maritime attorneys are recognized as leading advocates for merchant mariners by the United States Government, including the US Congress, the US Coast Guard, and the Department of Homeland Security, as well as the United Nations, the International Maritime Organization, the International Labour Organization and maritime trade associations. Jacksonville-based Crowley Holdings Inc., a holding company of the 126-year-old Crowley Maritime Corporation, is a privately held family and employee-owned company that provides marine solutions, energy and logistics services in domestic and international markets. Crowley operates under four business units: Crowley LOGISTICS, a singular ocean liner and logistics supply chain division; Crowley SHIPPING, which encompasses ownership, operations and management of vessels, including tankers, container ships, tugboats and barges; Crowley FUELS, a fuel transportation, distribution and sales division that also provides liquefied natural gas (LNG) and related services; and Crowley SOLUTIONS, which focuses on government services, including vessel management for government agencies, as well as engineering, project management, naval architecture through its subsidiary Jensen Maritime, and marine salvage and emergency response through its 50 percent ownership in Ardent Global. Additional information about Crowley, its subsidiaries and business units may be found at http://www.crowley.com. 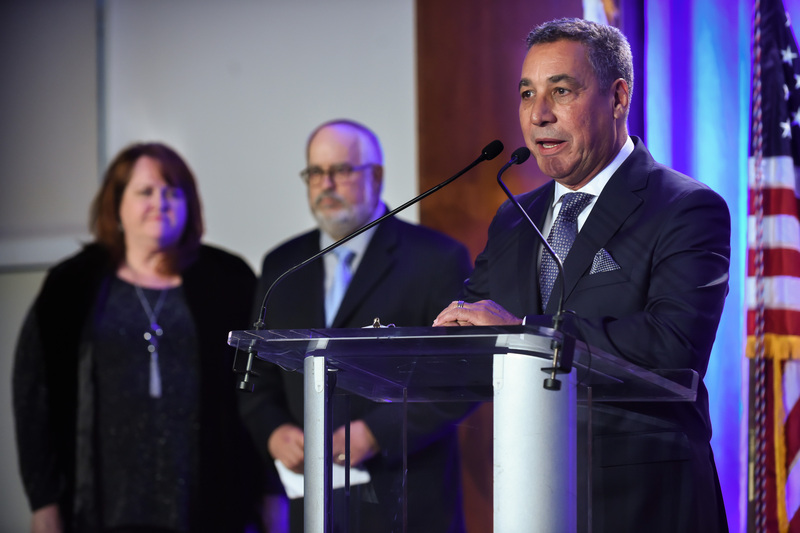 Jose Nazario, Finance Director, San Juan, accepts the award on behalf of the company's 350 Puerto Rico employees.